This is x2dino living in Bukit Panjang. I am a Executive, work in Toa Payoh. French, Thai are my favorite cuisines. I also love Restaurant, Café and Seafood, Steaks and Grills, Buffet . We visited Pies & Coffee for their DBS 1-for-1 breakfast set promo and ordered a set of Hearty Brekkie and Smoked Salmon Stacked. Both breakfast sets come wither either a cup of orange juice or apple juice. The set consisted of toasted Belgian waffles, scrambled eggs, cheesy chicken sausage, and mesclun salad with homemade citrus dressing. My only gripe was that the Belgian waffles were a little cold and could have been crispier. 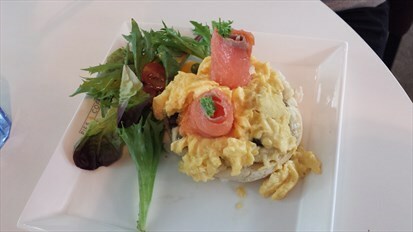 Toasted bagel stacked with scrambled eggs, mashed potatoes with green peas, sautéed button mushrooms and two slices of smoked salmon, this breakfast set lacked punch as it was rather bland and light. I was expecting a little more smoked salmon slices but for the promotion, it was still acceptable. Service was poor as staff were not very professional. They had some issue with my card initially and instead of checking their own system, insisted that my card was faulty. I ended up having to call the bank’s customer service to confirm that my card is in order before they checked their own system. Honestly, if not for the promotion, I would have simply left. The husband was suddenly craving for Chakey’s Chicken and drove all the way down to the East just to satisfy his tastebuds (we live in the West, so you could image how much he was yearning to sink his teeth into the famous salt-baked chicken). At $18.80 for a large chicken, I would say it was slightly above average pricing. However, for the taste and quality, it was all worthwhile. The chicken was extremely soft and tender. Paired with their signature sauce which was rich and aromatic, this dish definitely was addictive! By the way, the shop does not have any dine-in facilities, so you could only do take-away and savour the marvelous treat at the comfort of your home.